Break Da Bank Classic Slot Guide & Review - Casino Answers! 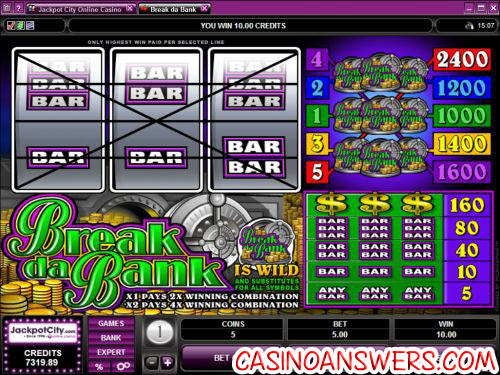 Break da Bank is a 3-reel, 5-line slot machine developed by Microgaming, featuring wild symbols and multipliers. You can play the Break da Bank slot machine at Lucky Emperor Casino and Grand Hotel Casino. To play the Break da Bank slot machine, you will want to set the coin size you’re going to be using first. Your choices for bets are $1, $2, $5, $10, $20, $25, $50 and $100. Then, you can choose to play from 1-5 coins per spin. Each coin you play will activate another payline. To be eligible to win the game’s top jackpot (which will be expanded upon later in this review), you make the maximum 5-coin bet. Because the lowest total bet in the game is $1 and the highest is $500 per spin, Break da Bank is ideal for high stakes players and high rollers, rather than low stakes players or casual slots players. When you are satisfied with the wager you have set, hit the “Spin” button to play. Alternatively, you can use the “Bet Max” button to play all five coins and all five paylines. To win the 2400 coin top jackpot on the Break da Bank slot machine, you must hit three Break da Bank symbols on the fifth payline. The fifth payline goes from the bottom left to the top right positions on the reels. The only way to win the top prize on Break da Bank is to play the maximum bet, which Casino Answers strongly recommends. The Break da Bank symbol is the wild symbol and will substitute for all other symbols in the slot game. It will also act as a multiplier; one symbol doubles your winnings, two symbols will triple them. Obviously, this is the most desired symbol on the slot machine. Payouts on the Break da Bank 5-line slot machine are (1/2/3/4/5 coin payouts in parenthesis): any 3 Bar symbols (5), 3 Single Bar symbols (100), 3 Double Bar symbols (40), 3 Triple Bar symbols (80), 3 Dollar Sign symbols (160), 3 Break da Bank symbols (1000/1200/1400/1600/2400). Hit the “Expert” button to access additional settings and options on the Break da Bank slot game. One of these modes will be autoplay. You can play 5 or 10 autoplay spins with no advanced settings by hitting one of the two buttons on the screen. If you want to use the advanced settings, hit the “Auto Play” button. You will be able to set the following spin settings: number of spins (5, 10, 25, 50, 100, 250 or 500) and number of seconds between spins (0, 0.25, 0.50, 0.80 or 1.50). Stop settings available are: stop once all spins are complete, stop when jackpot is won, stop if a win exceeds or equals ($25, $50, $100, $250, $500, $1000 or $2500), stop on any win and stop if credits increase/decrease by ($25, $50, $100, $250, $500, $1000 or $2500). You can cancel autoplay at any time. Break da Bank is an excellent high roller slot that gives you the chance to win big. You can get a $10 free no deposit bonus and a $100 signup bonus to try Break da Bank out at Lucky Emperor Casino! Isn’t Break da Bank a video slot? Break da Bank is a reel slot machine. You are thinking of its sequel, Break da Bank Again, which you can also play at both Lucky Emperor Casino and Grand Hotel Casino. Are USA players able to play Break da Bank for real money? No, players in the United States cannot play this slot machine for real money. For a similar US-friendly slot machine, please read our Bust-A-Vault Rival Slot Machine Review. Is there a Break da Bank Flash game for Mac users? Macintosh players and other players who prefer the no-download instant play casino can find a Flash version of Break da Bank at Lucky Emperor Flash Casino. If you cannot get the Flash slot game to load, try installing the latest version of Adobe Flash Player. What break da bank slot machines are there? What is the first break the bank slot machine? Where can I play Break Da Bank Again?